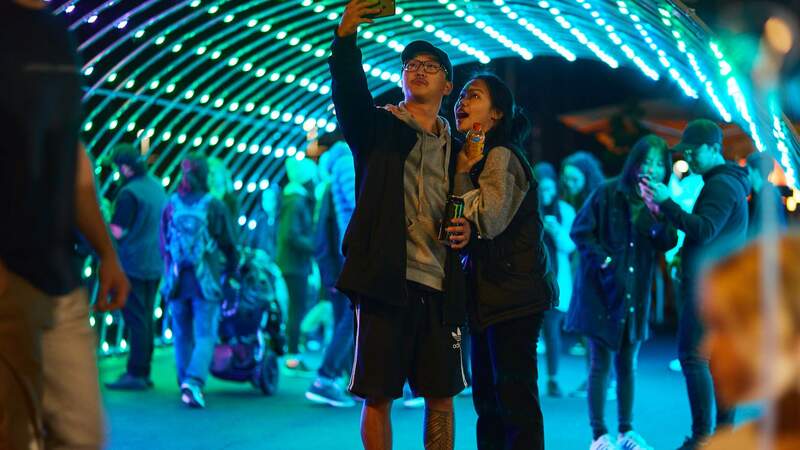 After attracting more than 60,000 punters last year, Auckland's kaleidoscopic festival of light will return to the waterfront next month. The free, all-ages Bright Nights festival is a five-day lighting experience from award-winning Angus Muir Design and Viaduct Harbour Holdings. This year the immersive lighting experience will come to life from May 8—12, 2019. It will feature a trail of more than a dozen installations weaving through the waterfront hospitality destination from Viaduct Events Centre to Waitematā Plaza. Auckland-based light artist Angus Muir is already known for revitalising spaces with mesmeric and interactive experiences. For Bright Nights he has assembled a number of renowned artists who will showcase a variety of cutting-edge technology in their lighting works. Once again, the theme of clean seas and sustainability underpins the festival's storyline. Trilogy from Simon Holden is a six-metre-high beacon calling for its audience to draw near, touch and perform. Played like a string instrument, the installation responds with a symphony of lights and sound. Created by Australian duo Amigo and Amigo, Crank Zappa is a giant interactive jellyfish constructed from single-use plastic waste. A workshop with Viaduct Harbour's Seabin Project will allow guests to hang 'plastic chandeliers' mimicking the tentacles of the piece. Other artist installations include Muir's own UV Spaghetti involving luminous jungle comprising four square metres of glow-in-the-dark ropes, and Shish-ka-buoy, comprising illuminated spheres on skewers. Te Wero Island will host an experiential space, featuring a canopy of lanterns and a silent disco starring award-winning Kiwi musician Ladi6, while Vector will host a sustainable light show on the Harbour Bridge each evening during the event. The festival will end on the Sunday, 12 May with a fireworks display. See the full lineup of works here.